Lithium-ion batteries are ubiquitous in small electronics, power tools and large power packs (plug-in) hybrid power transport and grid systems. The serious safety problems of lithium/sodium batteries have hampered their large-scale use. Traditional electrolytes are highly flammable and volatile, and can cause catastrophic fires or explosions. The introduction of a flame retardant solvent into the electrolyte typically results in a decrease in battery performance due to the improper passivation of the carbonaceous anode by these solvents. 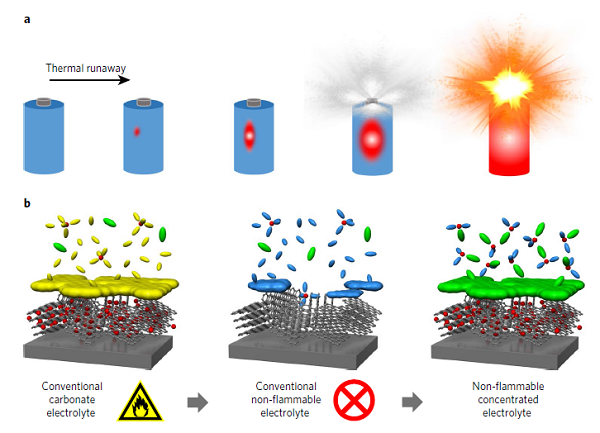 Recently, the team of Atsuo Yamada (Corresponding author) of the University of Tokyo in Japan reported a concentrated salt electrolyte design that solves the above difficulties by spontaneously forming a strong inorganic passivation film on the anode. The experiment proves that the concentrated electrolyte using salt and common flame retardant solvent (trimethyl phosphate) does not contain any additives or soft binder, so that the stable charge and discharge cycle of hard carbon and graphite anodes exceeds 1,000 cycles (more than one year). This performance is comparable or superior to that of conventional combustible carbonate electrolytes. 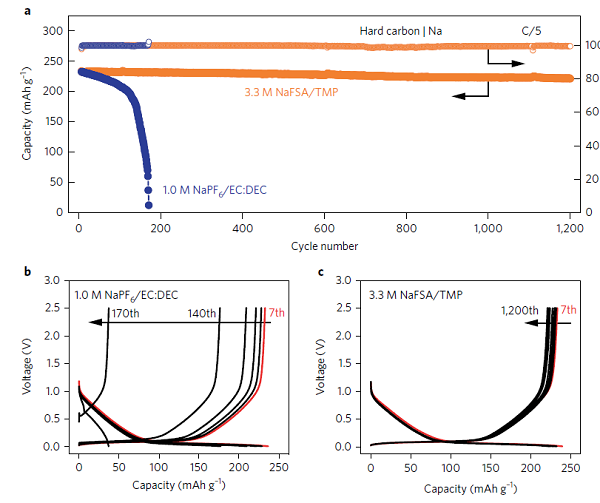 The unconventional passivation characteristics of concentrated electrolytes combined with their fire-extinguishing properties help to develop safe, long-lasting batteries to develop batteries with higher energy densities. 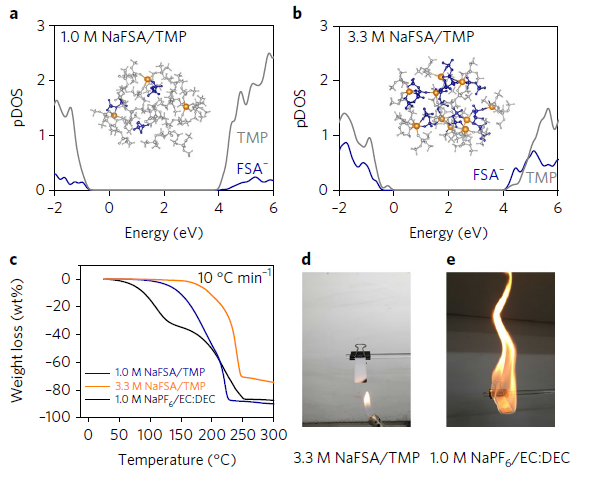 The related results were published in Nature Energy under the title "Fire-extinguishing organic electrolytes for safe batteries". For more advanced batteries, research development is divided into two types: one is the use of "different chemistry" of emerging devices for greater energy density, and the other is the use of "different elements or component materials" for additional functionality, These two features sometimes require a redesign of the manufacturing process. The team developed a fire extinguishing organic electrolyte for rechargeable batteries based on the concept of concentrated salt electrolytes. The concentrated NaFSA/TMP and LiFSA/TMP electrolytes were used as model systems for sodium ion and lithium ion batteries, respectively, which proved that they are not only a strong fire extinguishing agent, but also can stably carry out hard charge and discharge cycles, and can be degraded. Neglected, this is comparable or better than the performance of conventional combustible carbonate electrolytes. This design strategy is extremely simple and flexible, and can be extended to various combinations of non-flammable or flame retardant solvents and alkaline salts, providing a new way to develop safe and high performance rechargeable batteries.